To ask Brian Katcher questions, please sign up. Hello, Brian! Could you tell us a little bit about your new novel? Zak 'Duke' Duquette wants nothing more out of life than to play video games, hang with his friends, and attend Washingcon, the largest comic book convention in Seattle. This is especially true this year, now that his widowed mother has remarried and his stepfather insists on living with them. Unfortunately, Zak has blown off a major assignment for a class and is in danger of failing...and by failing, not graduating. The only way he can make up the credit is to 'volunteer' as an alternate at a quiz bowl tournament...the weekend of Washingcon. Ana used to have an older sister, Nicole. Nicole bent the rules. Ana doesn't have a sister anymore. At the Friday tournament, Zak gripes nonstop about the convention he is missing: the wild parties, the crazy costuming, the nonstop fun. Clayton is intrigued. So intrigued, in fact, that under the cover of the Seattle rain, he sneaks out of the hotel to see this event for himself. Ana and Zak have to drag Clayton back to the hotel before the sponsor realizes he's gone. Zak knows the con like Han knows the Kessel Run. He can flush Clayton out, no problem (and maybe score points with Ana). Ana, on the other hand, knows her brother can be very devious when he wants to, and realizes what will happen if her parents find out he ran off. Together, Ana and Zak descend into a world of Klingons, furries, bronies, cosplayers, filkers, Wookies, drunks, geeks, and party animals. They run afoul of a angry girl with a longbow, a seven-foot-tall viking, a pack of zombies, and several of Zak's ex girlfriends. As the night wears on, they start to realize the only ones they can depend on are each other. And maybe that's not such a bad thing. Almost Perfect is one of my all time favorite books. I was wondering, what inspired you to write the novel? Was there any hesitation to have it published? Brian Katcher Thank you! Well, I wanted to write a boy-meets-girl story that hadn't been done a million times. I eventually hit upon the idea of a heterosexual guy…moreThank you! Well, I wanted to write a boy-meets-girl story that hadn't been done a million times. I eventually hit upon the idea of a heterosexual guy who falls for a girl who had to work to achieve her female identity. Could such a relationship work? I tried it as a short story, but my writers' group told me that I couldn't pull that plot off in 80 pages. Do it as a novel or don't do it. It took a lot of research, and the more I talked to real life Sages, the more I realized that this was a story that needed to be told. As to publishing hesitation, not really. In fact, Almost Perfect was probably the easiest of all my books to have published. I was lucky to have an editor who was willing to take a chance on the topic. We’d love your help. Let us know what’s wrong with this preview of Ruthless by Carolyn Lee Adams. We’d love your help. Let us know what’s wrong with this preview of Girls on the Verge by Sharon Biggs Waller. We’d love your help. Let us know what’s wrong with this preview of Forever Nerdy by Brian Posehn. Great adventure story about three senior citizens proving that life does not end at sixty. Engaging characters, an original plot, and lots of humor kept me turning pages until the end of the trip. “Everyone has that one line they swear they'll never cross, the one thing they say they'll never do. Not something serious like I'll never kill anyone or I'll never invade Russia in the winter. Usually, it's something less earth-shattering. I'll never cheat on her. I'll never work at a job I hate. I'll never give up on my dreams. We draw the line. Maybe we even believe it. That's why it's so hard when we break that promise we make to ourselves. Which book should the YA LGBT Group read for our February 2013 Book of the Month? A place for fans and readers of author Brent Hartinger to discuss his work. 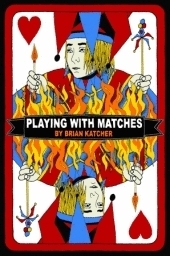 In this group we will talk about the book Almost Perfect by Brian Katcher. We will discuss the characters and everything about the book! A local to Columbia, MO, Young Adult book club. This groups discusses favorite books and their transformation to the silver screen. Hi Brian! Thanks for the friendvite! I really liked your short story. Well done! Wow, my cats don't even have middle names. I'm glad that my book touched you so much. My next book should be out in summer of 2012. Thanks for the pick me up! I've been wanting to tell you that my cat's middle name is Sage, after your character. :) Please keep writing--your characters are so intriguing to me!